Stegosaurs. Triceratops. Tyrannosaurus Rex. 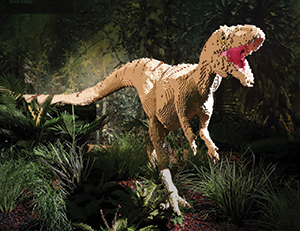 The Milwaukee County Zoo is “building” excitement to present Brick Dinos this summer for visitors to step back in time with dinosaurs in LEGO® bricks! In 2018, guests interacted with life-size replicas of their favorite ferocious dinosaurs. But, a new journey awaits guests the summer of 2019! 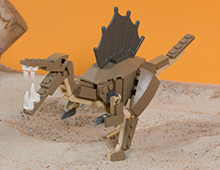 Visitors have the opportunity to become LEGO paleontologists in this interactive exhibit, stomping in May 25 through September 2. As visitors venture through the exhibit, they’ll come face-to-face with the menacing Masiokasaurus, enhanced by lighting and sound. The 13-foot-long Masiokasaurus, which means vicious lizard, perfectly describes this meat-eating dinosaur with razor-sharp teeth. Between visiting the many LEGO recreations of fossils, dinosaur skeletons and paleontologist digs, guests can join in interactive play bases. One play base allows children to let their imaginations run wild building a dinosaur and placing it in the diorama for other visitors to see! 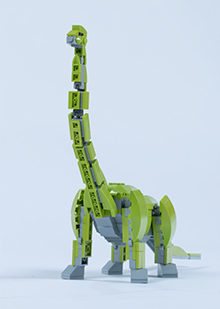 Brick Dinos was built in consultation with a leading paleontologist to ensure that all models are as accurate as possible based on current knowledge. Based in Edinburgh, U.K., Warren Elsmore spends his day creating imaginative and unique models with LEGO bricks. Elsmore’s exhibits range from a walk through history to icons of the silver screen. No idea is too outrageous to make it into LEGO brick form! His exhibitions travel the world, and have entertained and mesmerized more than half a million visitors from young to old. A lifelong LEGO fan, Elsmore, released Brick Dinos in 2017. Brick Dinos took the team of LEGO builders, designers and welders six months to create. The largest dinosaur in the collection took 12 weeks alone to build! At one point, the team had 20 people working on the exhibit! Developed in 1958, LEGO bricks, a toy as old as dinosaurs, have been around for 60 years. These bricks can be combined in 915 million ways with just 6 bricks! A person could use a combination of LEGO bricks from both 1958 and 2018 since each piece is compatible with all other pieces! Not wild enough? Today there are 86 bricks to every person on earth! Still feeling the LEGO fever from “LEGO Movie 2: The Second Part?” Then visit Brick Dinos, sponsored by Sendik’s Food Markets, open daily, 9 a.m. to 5 p.m., and located in the Otto Borchert Family Special Exhibits Building! Admission is $3 per person, after regular Zoo admission.